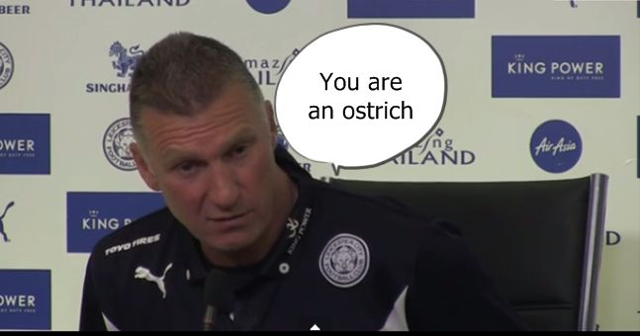 Leicester City manager Nigel Pearson appeared to totally lose the plot in this post-match press conference on Wednesday evening, following his side’s 3-1 home defeat to Chelsea. The defeat ended a four-game winning streak for the Foxes, who have done well to lift themselves out of the relegation zone with their recent form, though that doesn’t appear to have been enough to lift the pressure off their manager. Pearson, 51, has often looked a tense figure this season and has been involved in some strange post-match press interviews before, as well as appearing to try and strange an opposition player on the touchline during a game. This latest episode has seen the former England Under-21 boss take aim at one journalist in particular after yesterday’s game, asking him if he was an ostrich with his head in the sand, and ending by calling him stupid before storming out, BBC Sport reports. Watch more like this with our FREE Sports video app!